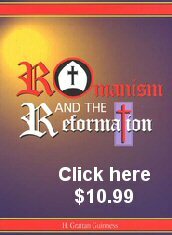 " Romanism and the Reformation"
Was an Irish Protestant Christian preacher, evangelist and author. 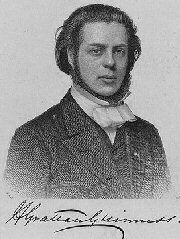 He was the great evangelist of the Evangelical awakening and preached during the Ulster Revival of 1859 which drew thousands to hear him. He was responsible for training and sending hundreds of "faith missionaries" all over the world. THE following lectures were delivered, by request, under the auspices of the Protestant Educational Institute, at Exeter Hall, in the spring of this year . That Institute exists to do a much needed work—to keep alive, especially in the hearts of the rising generation, some measure of intelligent sympathy with the Protestant traditions of our country. England’s Protestantism has long been England’s glory, and the direct cause of her unrivaled prosperity and peculiar preeminence among the nations of Europe. That Protestantism is now sustaining a double attack, from without and from within. Yet few seem fully alive to the danger. give three away to friends!! The late Lord Beaconsfield saw it clearly enough however. “Your empire and your liberties are more in danger at this moment,” he said, “than when Napoleon’s army of observation was encamped at Boulogne.” What would he have said had he lived to see the present position of affairs! (Psst what would he say in 2014?) The Reformation of the sixteenth century, which gave birth to Protestantism, was based on Scripture. It gave back to the world the Bible. It taught the Scriptures; it exposed the errors and corruptions of Rome by the use of the sword of the Spirit. It applied THE PROPHECIES, and accepted their practical guidance. Such Reformation work requires to be done afresh. 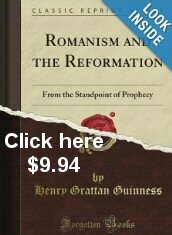 We have suffered prophetic anti-papal truth to be too much forgotten. This generation is dangerously latitudinarian—indifferent to truth and error on points on which Scripture is tremendously decided and absolutely clear. These lectures, simple and popular as they are, will, it is hoped, open many minds to perceive that the Bible gives no uncertain sound as to Romanism, and that those who will be guided by its teachings must shun an apostasy against which the sorest judgments are denounced. The lectures are given as delivered, with the exception of the first and last, which have been extended and modified. In recasting and enlarging the opening lecture on the Daniel fore-view, and the closing one on the Reformation, I have availed myself of the valuable help of my beloved wife, who has for so many years been my fellow laborer both in literary and evangelistic work. I shall rejoice if these lectures obtain a wide circulation, for they contain, I am sure, truth for the times,—truth deeply and increasingly needed, not only for the preservation of the civil and religious liberties of our country and empire, but for the practical guidance of the people of God in these last days.